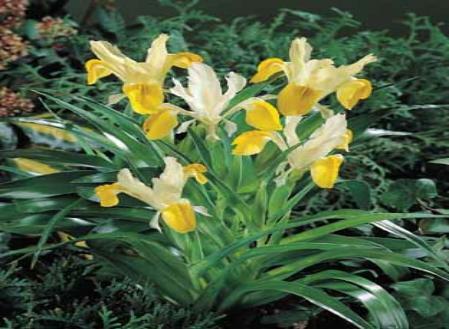 Botanists distinguish more than 200 species of irises. Some of these have bulbs, while others have short rhizomes and are classified as perennial plants. Iris germanica and I. sibirica are the two most familiar species among the perennial plants. 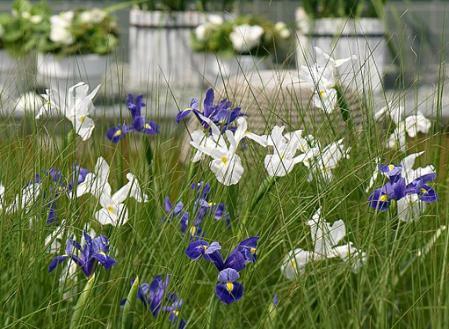 The bulb-forming species are very useful for garden planting, and the 'Dutch iris' is used for the year-round production of cut flowers. The smaller species make wonderful plants for the rock garden, or they can brighten up a barren border very early in the year. These species are beautiful when combined with any other early-flowering bulbous plants, e.g., snowdrops, snowflakes, Winter aconite, Crocus ancyrensis ‘Golden Bunch’, etc. 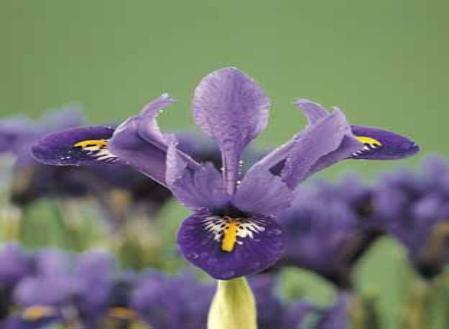 They are also appropriate for accompanying early-flowering perennials such as Draba sibirica, Pulmonaria (Lungwort), Viola ordorata (Sweet violet), Primula Juliae Hybrids, and Hepatica.It sometimes happens that the miniature irises, because of their extremely early flowering, suffer damage from periods of late frost or ground frost. By growing them in pots, you have the possibility of moving them temporarily to a more suitable location: a cool room that receives light. High temperatures, however, are absolutely not tolerated. This species is distinguished by the placement of the leaves along its flower stalks and the unusual bicoloured flowers that are delightfully scented. Landscape uses: borders, rock gardens, and under shrubs and trees. This species was introduced from Turkey in 1876. It has yellow flowers with brown flecks at the base of the outer wreath of petals. Bloom time is early. These Irises never grew wild in the Netherlands. Instead, they are the products of hybridisation carried out by a Dutch plant breeding firm by the name of Tubergen. Two species playing an important role in the development of these hybrids were I. xiphium and I. lusitanic. For growing them, a rich, well-drained soil is important for success. 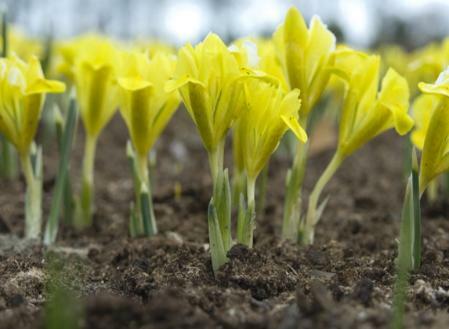 The bulbs can be left in the ground if desired, but there is a risk of disease. The flowers are 10 cm in diameter, and the flower stalks are very sturdy - a quality which makes them quite suitable for use as cut flowers. The colour assortment is very wide and includes bicoloured varieties. 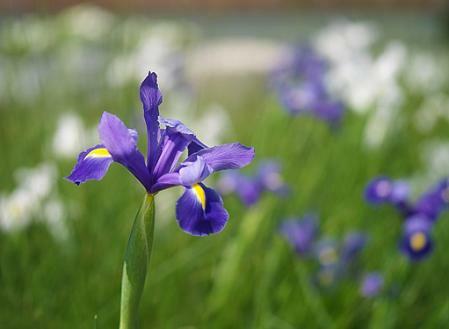 These dwarf irises, which originally came from such areas as Turkey and the Caucasus, are cultivated on a fairly large scale. They bloom very early in the season. The flower is quite large in relationship to the plant as a whole, and the flower colour of the species is violet-purple. I. reticulata are especially appropriate for use in rock gardens. Naturalising is possible. One drawback is that they develop many leaves during the flowering stage, diminishing an otherwise dramatic appearance. There are many different cultivars available.